Location: Adjacent to Manchester-Boston Regional Airport. Access from multiple directions -- from Harvey Rd via either South Willow St./Route 293 or Exit 5 off Route 93 as well as access from Everett Turnpike via Pettingill and Harvey Roads. Building Description: 40,511 square foot industrial building—architectural block and steel construction. Space Description: Very attractive property–high quality r&d/light manufacturing spaces with attractive office space & ample on-site parking. Common Maintenance: Tenant pays pro rata share of CAM ($1.33 per sq. ft. for calendar ’18). Maintenance: Tenant is responsible for interior maintenance, including heating/air conditioning systems. Utilities: Natural gas; PSNH electric; municipal water & sewer. HVAC: Unit #3 is fully air conditioned and heated..
Clear Height: 13'10" in warehouse. Loading: Unit has two tailboard level loading doors. 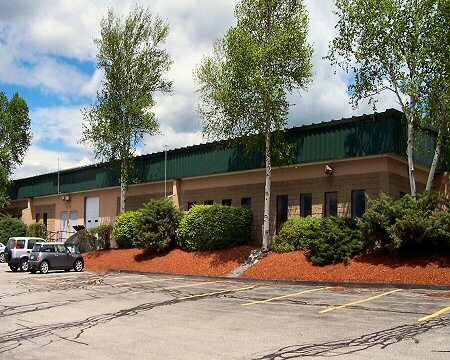 Location: Adjacent to Manchester-Boston Regional Airport with access from Harvey Road via either South Willow Street/Route 293 or by way of Exit 5 of Route 93 or via Perimeter Road from the Everett Turnpike/Route 3. Utilities: Natural gas; PSNH electric; municipal water and sewer. Electric Service: 600 amp, three-phase/208 volt.